Fabulous Coq Au Vin (chicken in red wine)! | Fabulous Weekend Cooking!! ← SUPER easy apple pie – I promise!! Fabulous Coq Au Vin (chicken in red wine)! This meal is definitely worthy of fabulous weekend cooking! My dad used to make this when I was a kid and I always loved it – I just started making this myself last year. If you don’t have a lot of prep time, don’t choose this meal. I think it took me an hour or so…but you won’t be disappointed with the end result! This is one of my FAV chicken dishes. Again, trying to stay low carb I served this over roasted mashed parsnips. My family wasn’t too keen on them, but I thought they were delicious!! After much googling, I chose a recipe on FoodNetwork.com from a show called Sara’s Secrets. I made many modifications, sort of by accident. I didn’t read the full recipe before I started doing some prep (DUH that is always a must). I bought a bag of pearl onions and went ahead and prepped them before I realized she has a whole recipe for brown-braised onions. I will include the link to her recipe if you want to see it, because I plan to try that next time I make this. This recipe serves 4 adults. Pearl onions can be a real pain to handle (especially because there are so many) if you try to peel them without boiling first. So here’s a tip: boil them for 2 minutes (no longer or they will be too mushy), cut the end off on the opposite end of the root, and holding it by the root, squeeze and the onion should pop right out. If it doesn’t, it will still be much easier to peel. 6 slices of bacon, cut into 1 inch pieces. 6 bone-in chicken thighs, 6 chicken legs, rinsed and patted dry. I use skinless chicken because I only like chicken skin when it’s roasted or fried, but it’s your choice. I feel this dish really needs dark meat because chicken breast isn’t nearly as tender or moist, but if you choose to use breast meat, make sure it’s on the bone. In a large heavy bottomed casserole (Dutch oven) saute the bacon slowly in 2 TBSP hot butter until it is very lightly browned. Use med-high heat. Remove to a side dish. Brown the chicken well on all sides in the bacon fat, season with salt & pepper. I had to do this in 2 batches. Return the bacon to the pan with all the chicken, cover, and cook for 10 minutes. Uncover and pour in the cognac. Averting your face, ignite the cognac with a lit match. Shake the casserole back and forth until the flames subside. Pour the wine into the casserole. Add just enough chicken stock to cover the chicken. Stir in the tomato paste, garlic, and herbs and mix well. Add the mushrooms and onions. Bring to a simmer (low boil). Cover and simmer slowly on lowest heat for 2 hours. Using a slotted spoon, remove the chicken, onions, and mushrooms to a side dish. Ladle 1/2 of the remaining liquid into a small pot. Melt the remaining 4 TBSP butter in a small pan. Slowly whisk in flour 1 TBSP at a time until you reach desired consistency (a nice paste). Pour the paste into the liquid in the small pot and whisk until well blended. If this is not thick enough for your liking, you can slowly add in more flour while continually whisking until you reach desired thickness. On a plate, add roasted mashed parsnips, nestle 2 pieces of chicken with onions and mushrooms into the parsnips, and cover with gravy. You can also garnish with fresh parsley but I forgot to buy it. 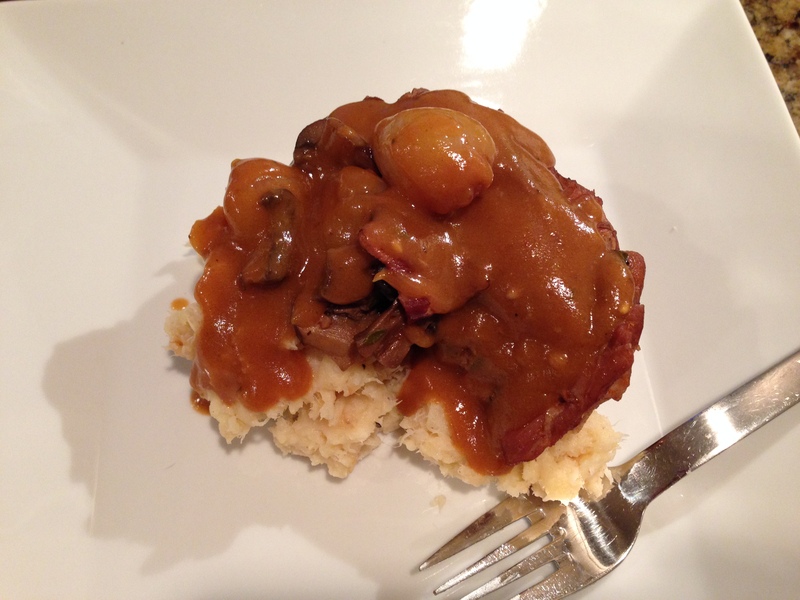 This entry was posted in Chicken, Main Course and tagged #coqauvin. Bookmark the permalink. 1 Response to Fabulous Coq Au Vin (chicken in red wine)!